This is the week we enact the central story of the Christian faith. These are challenging stories that invite us to re-pattern our lives. All people of all ages are invited to participate in the rich stories and symbols of this week. Parents: do what’s needed to make these services work for you and your child. Kids can come to later services in PJ’s, and you can leave early if needed. We need your help (from people of all ages!) for set up and clean up! If you’d like to help out, email Julia! 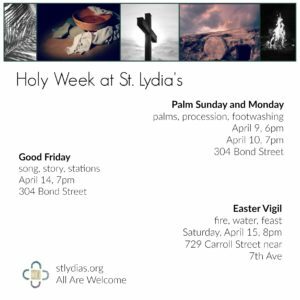 Palm Sunday and Monday Dinner Church with palms, procession, and footwashing Sunday April 9, 6pm; Monday April 10, 7pm 304 Bond Street, Brooklyn Once a year we do what Jesus did and kneel to wash one another’s feet. 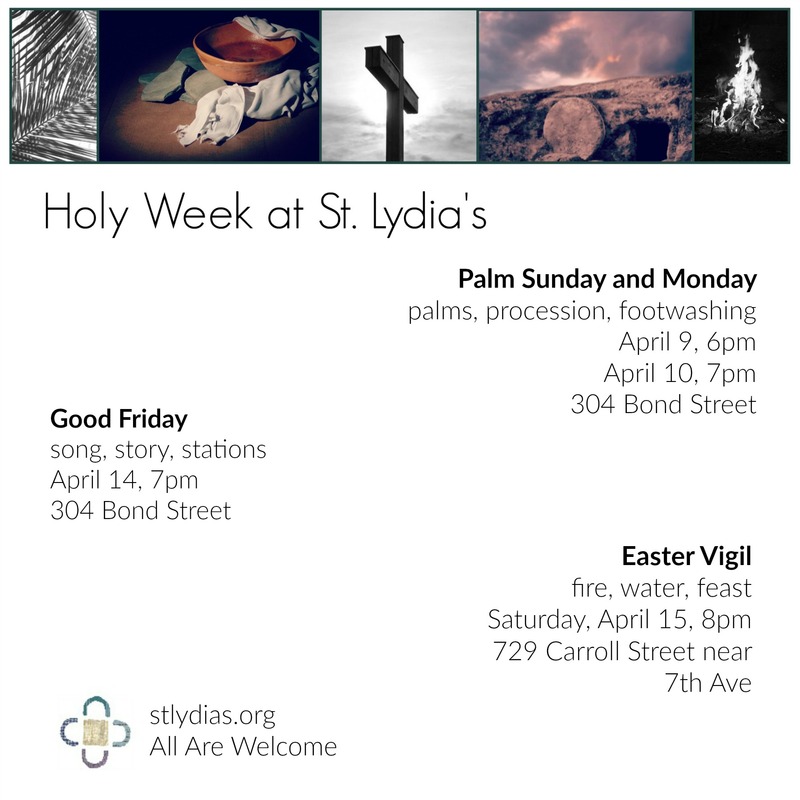 Remember to wear socks, not tights Good Friday with song, story, stations Friday April 14, 7pm 304 Bond Street, Brooklyn A solemn, service with music and silence, as well as movement and exploration of the themes of the day. A short portion of this service will take place outside; please dress warmly Easter Vigil with fire, water, and feasting Saturday, April 15, 8pm Old First Reformed Fellowship Hall: 729 Carroll Street near 7th Ave A bold celebration of our new life in Christ. You are invited to bring a potted daffodil to decorate the space. This service will begin outside; please dress warmly *Please note: there will be no Dinner Church on Sunday, April 16 or Monday April 17 . The Easter Vigil is our church for that week!